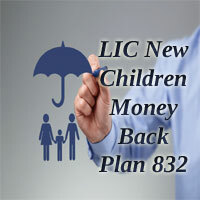 LIC New Children’s Money Back Plan is a regular premium payment money back plan. The LIC New Children Money Back Plan is a Non- Linked Plan specially designed to meet the financial needs of children. The Plan was introduced by Life Insurance Corporation on 04th March 2015 with UID 512N296V01. During the Policy Term, the child is provided with risk cover on their life. For the Life Assured of age above 8 years, date of commencement of risk cover starts immediately. If the child stays alive till the end of specified durations, survival benefits are provided. The Proposer can avail Death Benefit, Survival Benefit and Maturity Benefit in this LIC New Children Money Back Plan. The Rider Option is available for the Policyholder on payment of additional premium. The Life Assured can avail the Premium Benefit Rider option on payment of additional premium. The Policyholder will receive the 20% of Sum Assured as Survival Benefit at 18,20 and 22 years of age. On Maturity, 40% of Sum Assured along with reversionary bonus and Additional Bonus is provided to the Proposer. The Policyholder can take the Survival Benefit at any time after the due date but during the policy term. Loan Facility: The Life Assured can avail the Loan Facility as a % of Surrender Value. Minimum Entry Age 0 years. Maximum Entry Age 12 years (last birthday). Minimum Proposer’s Age 18 years. Maximum Proposer’s Age 55 years. Minimum Sum Assured Rs 1,00,000/-. Maturity Age 25 – (Age of Entry of Child in years). Death Benefit: There are two types of Risk Coverage for this LIC New Children’s Money Back Plan. They are. Death before the Date of Commencement of Risk: The amount equal to the total amount of premiums paid excluding extra premium, taxes, and rider premium is payable. Death After the Commencement of Risk: The Risk cover is available after completing the 8 years of Life Assured age or 2 years from the date of commencement of policy. For Accidental Death or Natural Death: Sum Assured + Bonus + Final Additional Bonus. Maturity Benefit: If the Policyholder survives until the end of Maturity Age, Maturity Benefit is provided. The amount of Maturity is equal to 40% of Sum Assured + vested Simple Reversionary Bonus + Final Additional Bonus. Survival Benefit: On Survival of the Life Assured at 18, 20 and 22 years of age, the Survival Benefit is provided immediately on completion of the following ages. The Survival Benefits are provided as follows. At the Age of 18 years = 20% of Sum Assured. At the age of 20 years = 20% of Sum Assured. At the age of 22 years = 20% of Sum Assured. There are three types of Rebates available in the LIC Children Money Back Plan. They are. NIL Rs 1,00,000/- to 1,90,000/-. 2 per thousand Basic Sum Assured Rs 2,00,000/- to 4,90,000/-. 3 per thousand Basic Sum Assured Rs 5,00,000/- and above. The Life Assured will receive the discount on tabular premium under Corporation’s Employee Insurance Scheme (CEIS) if the employee has taken the policy for the benefit of their children. If the Policy is not purchased through the agent, the CEIS Rebate is payable. The Policyholder can avail the Premium Waiver Benefit Rider on payment of additional premium along with the basic plan. The Rider can opt at the initial stage or at the policy term for a minimum base plan of 5 years. The Rider benefit can be availed at the time of death, accident or disability in which all the future premiums are waived off. Maximum Entry Age 55 years (nearest birthday). Premium Payment Term Same as the basic plan. Cover Ceasing Age 70 years (nearest birthday). The Policyholder can choose the option to take the Survival Benefit at any time on or after the due date but during the Policy term. In the case of postponement of the due survival benefit by the Life Assured, the LIC will pay the increased Survival Benefit as follows. Survival Benefits % x Sum Assured x Factor applicable to Survival Benefit (s). For Death Paid-up Sum Assured= [(Number of premiums paid/Total Number of premiums payable) x Sum Assured on Death]. Maturity Paid-up Sum Assured= [(Number of premiums paid/Total Number of premiums payable) x (Sum Assured on Maturity+Total Survival Benefits payable under the policy)]. Grace Period: The Life Assured is provided with a Grace Period of 30 days for payment of a due premium amount for Yearly, Half Yearly and Quarterly, 15 days for monthly payments. Loan Facility: The Loan that can be granted as a percentage of Surrender Value. Upto 90% – for inforce policies. Upto 80% – for paid up policies. Surrender Value: The Policyholder can surrender the policy at any time during the policy term, after completion of the payment of premium for 3 years. There are two Surrender Values. They are. Guaranteed Surrender Value = % of total premiums paid (net of taxes) – any extra premiums and premium for the rider. Special Surrender Value = The discounted value of the sum of Maturity Paid-up Sum Assured and vested Simple Reversionary Bonuses. Assignments/Nominations: The Policy can be assigned to the Nominee as per the Insurance Act. Free Look Period: If the Life Assured is not satisfied with the terms and conditions of the policy, the LIC Children Money Back Plan can be returned within 15 days from the date of receipt of the policy. Taxes: Taxes including Service Tax is applicable which varies from time to time. Suicide Clause: If the Policyholder commits suicide within the 12 months from the date of commencement of Risk, 80% of Premium is paid excluding taxes. The Customer can buy the LIC Children Money Back Plan from the LIC Agent or nearest LIC Branch Office. The Proposal form required to purchase the policy is available on the official website of Life Insurance Corporation. The Documents needed for buying the LIC New Children’s Money Back Plan are listed below. Proposal Form with a photo. Medical Reports (if any required). If the Policy Holder is met with sudden accident or disability within the Policy Term or Maturity Period of Policy is completed, the Nominee can lodge the Claim. The Claim Forms can be obtained from Official Website of LIC or from the LIC Regional Offices. During the Claim Process of LIC New Children Money Back Plan, the documents required are listed below. You can calculate the Minimum Premium that has to be Paid to take the Policy by using the LIC Children Money Back Plan Premium Calculator. The Amount of Single Premium Paid will depend on the Sum Assured, Policy Term and Age of the Life Assured. You need to enter Some Basic Information like Name, Mail Id, Mobile Number, Age, Policy Term, and Minimum Sum Assured to calculate the Premium Value. Is there are Rider Options available in this LIC Children Money Back Plan? Ans. Yes, Premium Waiver Benefit Rider is provided to the Life Assured on payment of additional premium. 2. What are the Proposal Forms required for LIC New Children Money Back Plan? Ans. The Proposal Forms of 340 or 360 are required and 300 (in the case of PWB). 3. Is the lapsed policy can be revived? Ans. The Policy can be revived within 2 years from the first unpaid premium amount.